Dr Lydia Cole is a researcher at the Institute of Integrative Biology's Department of Evolution, Ecology and Behaviour. Whilst everyone was sweltering under abnormally tropical temperatures in the UK during July, Dr Jenny Hodgson and I were away in the actual Tropics as part of our NERC-funded project Decision support for restoring ecological networks in rapidly developing, biodiverse countries. After attending the Association of Tropical Biology and Conservation’s annual meeting in Kuching, we flew on to Kota Kinabalu in Sabah, to attend a mapping project meeting. 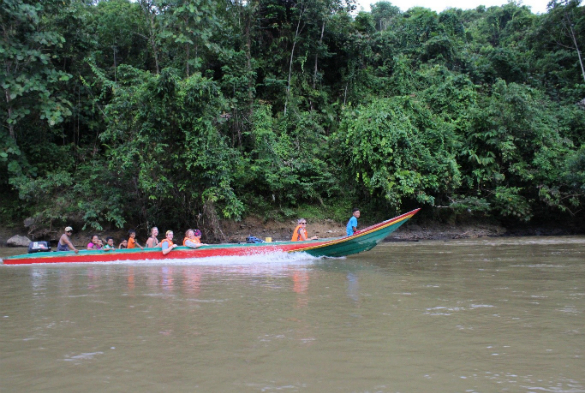 In order for us ecologists to understand the human-component of these forested landscapes, we were extremely fortunate to visit several different communities living in the Heart of Borneo region. We spent three nights in Kampung Sikalabaan, including one incredible day observing how members of the villages use their forest and its bounty of resources. Early afternoon, after walking upstream for quite some time, we stopped for a spectacular picnic: out of their woven baskets, the women produced a feast for the twenty or so of us, with freshly boiled rice, freshly picked aubergine broth and then to top it off, they caught and we cooked freshly-netted fish from the flowing waters two feet away. Beats a Sainsbury’s sandwich! Leaving the forest and returning to Kota Kinabalu was a bit of a shock, though the washing machine was welcomed! The next day we headed into the Forestry Complex at the Universiti Malaysia Sabah campus for two days of delivering Condatis training. We had 20 participants attend from a range of organisations and backgrounds. Jenny and I introduced the concept of Condatis, followed by an interactive session where we guided people through performing their own analyses using the new web version of the tool. Our final stop off on the trip was the island of Java. Our project partners guided us over the following three days, and were so patient in answering an almost continuous stream of questions from us interested and unacquainted British tourists! 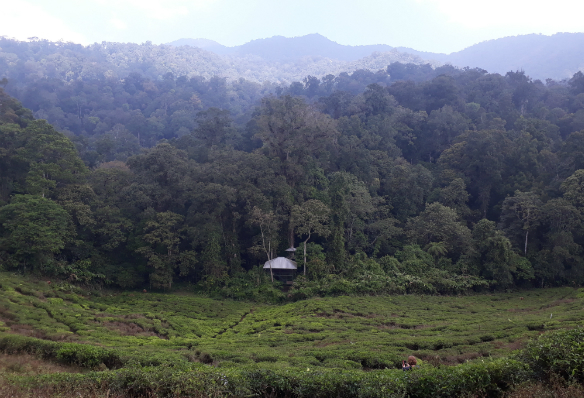 We observed a complex, fascinating landscape as we drove to Mount Halimun Salak National Park, our case study landscape to the south of Bogor. Inside the Core Zone of the National Park there remains one of the largest continuous tracts of tropical forest in Java, and it is intact due to strict protection. Outside of this zone, there is a complex mosaic of human-modified landscapes, with degraded forest in between tea plantations, hydrothermal electricity plants and football pitches. National Park staff talked to us about how they are working with individual communities to develop village-specific Memorandums of Understanding on responsible use strategies and to make decisions on where to establish collaborative forest restoration projects. During our stay we carried out another Condatis workshop, this time for ten staff members of the National Park. Through some lively discussions (mostly in Bahasa Indonesia!) we gathered useful feedback on the tool and how it could be usefully deployed in this landscape. We are hopeful that Condatis will generate maps that highlight priority areas for forest restoration in and around the park. Three action-packed weeks later we returned to the UK. Now it’s time to process all of the information we gathered on our travels across the islands of Borneo and Java. We thank everyone who made our trip so exciting, so interesting and fed us so much yummy food! Information in this postcard has been extracted from a set of two blog posts, accessible on the Condatis website here.